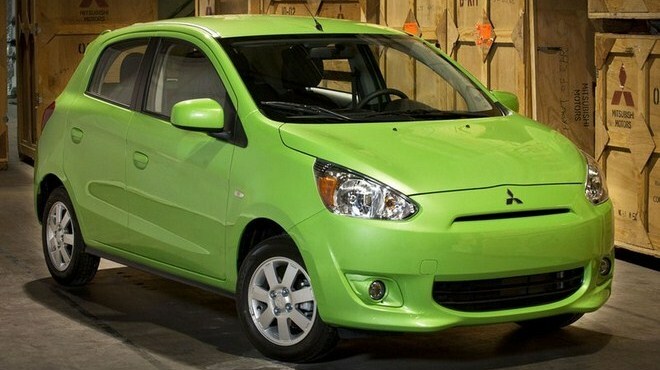 Note - see the U.S. debut details from the NY international auto show here: 2014 Mitsubishi Mirage U.S. debut in New York: details, photos, specs. However, we have at least confirmed the car's name: it will wear the Mirage badge, as it does in the rest of the world where it has recently gone on sale. At least one dealership has said the car will be available for sale in Canada in March (edit: now Mitsu is saying autumn). The U.S. will get it in September. This month's Montreal debut of the 2014 Mirage comes just one year after Mitsu showed off its "World Car Concept" on the show circuit. The concept car was a thinly disguised version of the production car. It's kind of funny to pretend we don't already know what the rest of the car looks like, but who wants to deny someone the fun of yanking the cover off a new car? 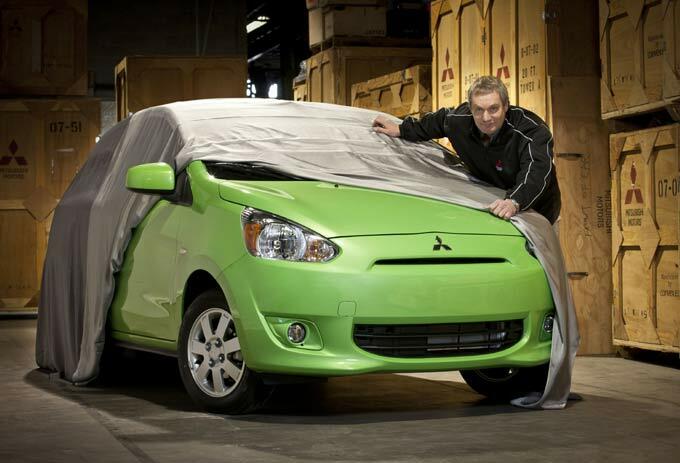 Mitsu Canada's National Marketing Director Peter Renz offers a peek of the new Mitsubishi which will debut at the Salon International de l'auto de Montreal on January 17, 2013. Wooo, tomorrow it comes out! Wooohoo. I can't wait to hear what Canada gets spec wise. It would be amazing if they got start/stop, but I highly doubt it... Anyway, it should hopefully come with all the aero goodies at least. Well the news is out. The most interesting tidbit is they're still not referring to it as "Mirage". Instead, they're awkwardly calling it Mitsubishi's new "global small car". That suggests they still haven't committed to a name for the U.S. market. I mean - who unveils a brand new car without a name? Quebec sales manager Patrick Renaud, added: "Fuel efficiency is our global focus, our company mission"
MMSCAN expects the new car's fuel economy to be among the best for gasoline-powered cars in Canada. Price to be in the "low teens"
warranty: 10 years or 160,000 km limited powertrain, five years or 100,000 km limited new vehicle and five years, unlimited mileage roadside assistance. money in a youthful, fun-to-drive hatchback. new car is expected to achieve superb fuel economy in city, highway and combined driving. Mitsubishi is fun, efficient, greener and affordable. We can’t wait!” he said. dealerships, it will rank as one of Canada’s most affordable and fuel efficient new cars. Lancer is “not far behind”. wheelbase, 2450 mm; wheels/tires, 165/65R14; output, 74 hp at 6,000 rpm and 74 ft. lbs. expected to hit squarely on all five, leading the industry in several. impressive, long list of standard equipment. The new car’s unique headlamp design and sculpted hood create an expressive frontal “face”. designed to accommodate five adults and luggage. Dark Grey, Blue Mica, Red Metallic, White, Cool Silver Metallic and Black Mica. Well that is a bit disappointing. I was hoping for a little more info. We already knew 90% of that. The only useful tidbit was that they do plan to sell the manual and CVT. Also, it seems like it'll go on sale later than expected too. I guess we'll have to wait it out until the New York auto show for more info. Last edited by Daox; 01-17-2013 at 06:36 PM. We have been delayed here in Aus for our Mirage to go on sale was going to be November 2012 then December 2012 then to early mid January now 22nd january. Wonder if they are having problems getting enough cars made due to maybe higher sales of them then they thought they would get. That's what I've read as well, Jamie - they've been selling well in the initial release markets. One good thing announced today: "class leading" fuel economy in the Canadian market. We'll of course have to wait for the official numbers now. I still think the platform title "global small car" denotes it was intended to be offered beyond developing markets. I'm glad I got one.